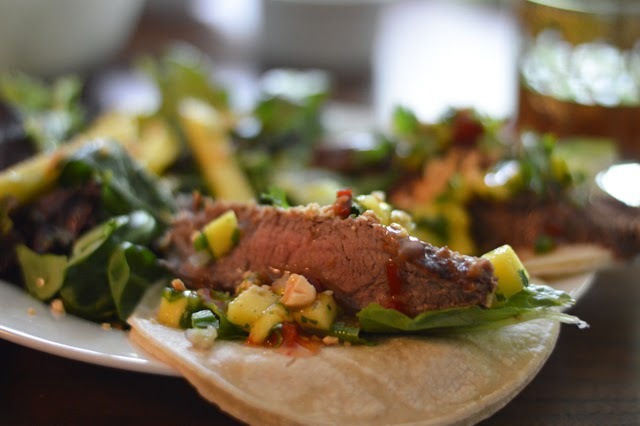 A too-zoomed-in, oddly-angled, cluttered shot of Thai Beef Tacos from my first recipe review. Well, guys, as it turns out, doing hard things is actually…uh…HARD. I spent a good portion of January feeling frustrated, discouraged and overwhelmed. But I also had a lot of good things happen. And the good news is that despite what it felt like, I’m making more progress than I think. I learned a few things this month. First, that I don’t actually want to shoot in Manual mode most of the time. What I want is Aperture Priority mode. And I have been doing that, albeit with back-up non-flash automatic mode, which is the same thing I’ve been doing forever. The reason is that I don’t want to have to remake recipes just because I didn’t get the shots I needed. I feel a little guilty for using a crutch, but not so much that I’m going to stop doing it. Remaking recipes for the sake of photographs ranks among my top least favorite things when it comes to this blog. I did find this set of tutorials: http://improvephotography.com/photography-basics and I’ve done the first lesson, but I need to prioritize sitting down at set times and working through it. I did schedule times twice a week, but I was bad about sticking to them. I actually did post recipe step photos to Facebook for the cannoli recipe I posted on Monday. I’m not sure how well Facebook works for that and I’ll probably only do it for the complicated recipes, but it was nice to be able to stash those extra photos somewhere. And hopefully helpful to people who might want to actually, ya know, cook. Ha! I didn’t do this. I didn’t even think about doing this. I’ve got a whole year though, right? If you’ve noticed that I didn’t post quite as many times in January as normal, this is the reason. For the recipes I posted, several were entirely of my own invention and I made much more than minor alterations to the others, which required a lot more testing and trial-and-error than I have typically done in the past. As a result, my posting schedule suffered a little bit. I can only assume I’ll get better at this. I also did a bunch of other stuff in January. I had this post on Wonkomance, two other guest posts on other blogs that will go up sometime in February, a sekrit project that I’ll talk more about when it comes out, and I worked with Megan Mulry on planning this social gathering for people coming to DC for the Popular Romance Project screening and conference on February 11th. I also did my first TBR Challenge post and visited all the participating blogs, which was so fun and I discovered several great new ones like Feminist Fairy Tale Reviews. Plus there was…life. This is still a hobby, after all. Actually, I went into this post feeling like I haven’t been very successful at any of the things I set out to do this year. But you know what? Sometimes I just have to give myself more credit. I had occasion to look back at some of my old posts this past week for a guest post that will go up later in the month and my photography has improved a ton even in just the nine months I’ve been writing this blog. So I didn’t exactly stick to my plan of doing photography tutorials twice a week. I guess in addition to Doing Hard Things, I also need to be Letting Myself Off The Hook. Does that sounds familiar to anyone else?